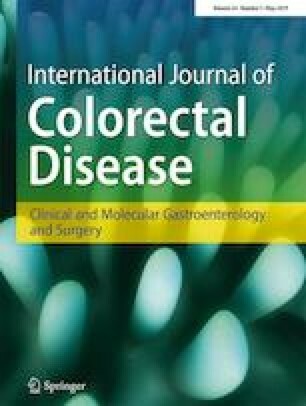 This study aimed to analyze disease presentation, management, and oncological outcomes of patients diagnosed with peripartum colorectal cancer (CRC). Retrospective cohort study of all consecutive women of childbearing age (18–45 years) between 2002 and 2014 diagnosed with CRC adenocarcinoma at a tertiary academic institution. Patients who experienced pregnancy within 12 months of their diagnosis (peripartum period, group 1) were compared to the remaining patients of the cohort (group 2). Overall survival (OS) was compared between the two groups through Kaplan-Meier estimates. Out of 555 consecutive women with a mean age of 37.8 + 6 years, 31 (5.6%) were diagnosed with CRC in the peripartum period. Of these, all patients were symptomatic during pregnancy due to bleeding, abdominal pain, or constipation; however, only 11 CRC (35.5%) were diagnosed during pregnancy, 1 (3.2%) during C section, and the remaining (61.3%) postpartum. TNM stage at presentation was I in 6 patients (19.4%), II in 4 patients (13.9%), III in 8 patients (25.8%), and IV in 13 patients (41.9%). Surgical resection was performed in 23 patients (74.2%): 2 while pregnant, 2 at the time of C section, and the remainder postpartum. Across all stages, OS was 95% at 1 year and 62% at 5 years and did not differ between the two comparative groups (p = 0.16). A suspicious attitude towards cancer-related symptoms during pregnancy is crucial to prevent delayed evaluation for CRC. Fabian Grass was supported by the Société Académique Vaudoise, Lausanne, Switzerland, and by the SICPA Foundation, Lausanne, Switzerland.